Garcia Lorca’s ‘House of Bernarda Alba’ is being reproduced for the fourth time in Sri Lanka with an all star studded female cast and will hit the Sri Lankan stage at Lionel Wendt on March 26 and 27 at 7 pm, under direction of Priyantha Sirikumara. Although it was written in 1936 ‘La casa de Bernarda Alba’ was not staged until late 1945 due to the murder of Lorca by the Nationalists. Since then the play has been reproduced over a 100 times, in many languages in many countries, as theatre productions, musicals and films. The play has been interpreted as a ‘Play of Women’ by Garcia Lorca, which is woven around a family of five daughters and a mother struggling to find their solidity through the conflicts of the day-to-day life. House of Bernarda Alba highlights issues of ‘sexual and political repression’, and reverse-oppression by victims who live under a ‘fascist regime’. The play questions the influence of class and religion on its characters where fanatic attempts to maintain honour through oppression ultimately result in death. 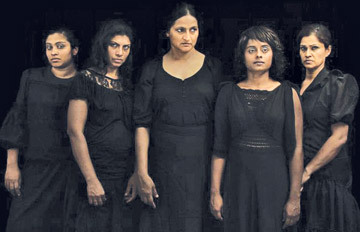 Kaushalya Fernando, Chandani Senevirathne, Chamila Pieris, Nadee Kammallaweera, Duleeka Marapana and others make up the cast of ‘House of Bernarda Alba’.